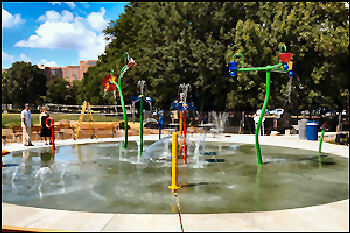 The spraygrounds are open Memorial Day Weekend to Labor Day Weekend. Sprayground Hours open 10am – 8pm everyday. Please note that hours may vary on holidays. School-Age Playground, Preschool-Age Playground (enclosed), Sprayground, (2) Adult Diamond Field, (1) Rectangular Synthetic Field, (1) Community Use Field, Restrooms, Portable Toilets, Basketball Court (2, lights), Tennis Court (6, lights), Tennis Practice Wall (2), Volleyball Court, Water Fountain (2), Picnic Shelter, Picnic Tables, Charcoal Grills, Paved Trail, Gazebo, Petanque court (3, no lights) with frost free hydrant. 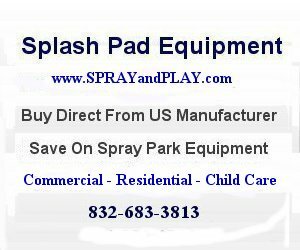 This entry was posted in Virginia and tagged Arlington, splash pad, spray grounds, spray park, Virginia, Virginia Highlands Park, water park. Bookmark the permalink. We went summer 2013 with my 2 year old and 5 month old and it seemed really suitable for both. It wasn’t over crowded and there were plenty of shades areas for the parents to sit put of the sun. I will have to say that the “parking is limited” is no joke. There are maybe 10-15 spaces you don’t have to pay for. Bring quarters, JUST IN CASE!